Another bold step by LA to retrofit as a dense transit oriented city (Curbed). Appeals court orders removal of 100 digital billboards across L.A.
LA’s digital billboards take big legal hit. A three-judge panel ruled that roughly 100 digital billboards installed in L.A. under a 2006 legal settlement approved by the City Council must be removed. Long Beach’s Ernest McBride High School (named after my wife’s grandfather – so yes this is a biased post!) to open next fall; first of a plan to build several smaller high schools. Village at USC approved by LA City Council; USC to pay $20 mil. for affordable housing. A .2-billion expansion of student, academic and retail space at USC has been unanimously approved by the Los Angeles City Council, a project that will create more than 12,000 jobs and potentially ease student housing demand in the campus neighborhoods. From trailer park to resort: Southern Cal’s smallest big city airport catches up with the times, and then some. (via LB Press Telegram). If it weren’t for the commercial airplanes visible through tall glass walls, travelers might mistake the new concourse at the Long Beach Airport for a resort hotel. List of downtown LA’s most blighted properties – at least in one author’s opinion. 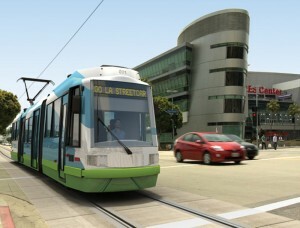 LA votes for downtown streetcar tax – great American Streetcar Scandal be damned! The effort to create a 5 million Downtown streetcar took a major step forward today, as local residents voted in favor of a plan to tax area property owners up to million to fund the project. LA continues commitment to mass transit, despite Measure J defeat, with Mayor-decreed transit corridor cabinet.